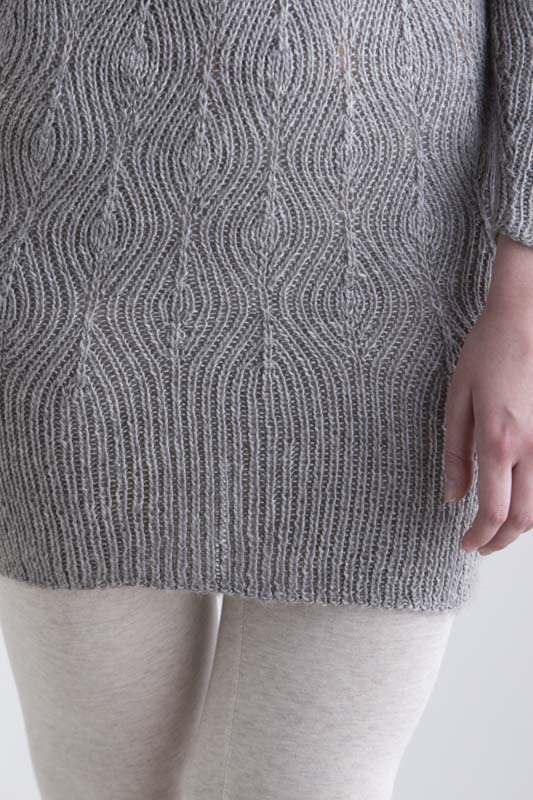 An undulating diamond rib pattern gives a tight, slinky fit to this knitted dress. Luxury yarn and nearly seamless construction make knitting this dress a pleasure. FINISHED SIZE 26 3/4 (32, 37 1/4)" bust circumference. Dress shown measures 26 3/4", modeled with negative ease. YARN Blue Sky Alpacas Metalico (50% baby alpaca, 50% raw silk; 147 yd [135_m]/1 3/4 oz [50 g]): platinum, 8 (9, 10) skeins. NEEDLES Size 6 (4 mm): 24" circular (cir) and set of double-pointed (dpn). Size 4 (3.5 mm): 32" cir. Adjust needle size if necessary to obtain the correct gauge. NOTIONS Markers (m); stitch holders. GAUGE 36 sts and 26 rows = 4" in Body chart patt on larger needle.